Since advertising is one of the lifelines to support the Free option of Spotify, Campaign ME just reported that Connect Ads (the very same ones who are officially appointed by Twitter for the MENA region) have been appointed as Spotify’s official sales advertising partner. Some of the inaugural advertisers for the region cited by Campaign ME include Samsung Gulf Electronics and The Coca-Cola Company. I’ve already posted a couple of follow-up questions to them, so here’s hoping they answer back. Steps are easily outlined on their website. It was the early word that Spotify is coming to the Middle East and North Africa region, then followed by the silent launch of invite-only registration (only for the plug to be pulled and replaced with a sign-up for updates page). Just in time to hit their launch window of November (and the looming winter holiday season), Spotify is now officially available across the Middle East and North Africa region for everyone. That expands their network to 78 countries as of 2018. If you’ve seen how Spotify prices its Premium subscription in other markets, you’ll notice that it’s not the same (it’s cheaper in Indonesia and a few other markets). Given that people in the Middle East would easily assume a pricing scheme similar to markets like the US and EU (it costs ~$9.99/month), they’ve gone with a monthly rate of ~$4.99 (each country’s website is not showing the price in the respective local currency). It’s almost the same monthly rate that you’d pay on other competing music-streaming services and what you’d pay in some of the Asia markets. As a further mark of celebration, Spotify has also launched the Arab Hub as part of its Global Cultures Initiative (they’ve done a similar version for Latin Hub and Afro Hub). For Arabic speakers, the official website has been updated with an Arabic version for some of the markets. Expect to see locally-curated playlists as well including Today’s Top Arabic Hits and Arabic EDM. In addition to offline listening for Premium subscribers and a Free option, Spotify has added a default data streaming option of 24kbps especially if you’re not on WiFi. You can pay by both credit cards and debit cards to sign up for Premium, and users will enjoy a 30-day free trial as well. Spotify may have been a bit late to the region, as Deezer beat them to it and Anghami has been around for quite a long time. Users will be at ease that they can easily access their original accounts from the non-MENA region without using a VPN. Overall, it’s good to see that they’ve hit their launch window and in the middle of November. This will definitely help in their next Q3 filing. 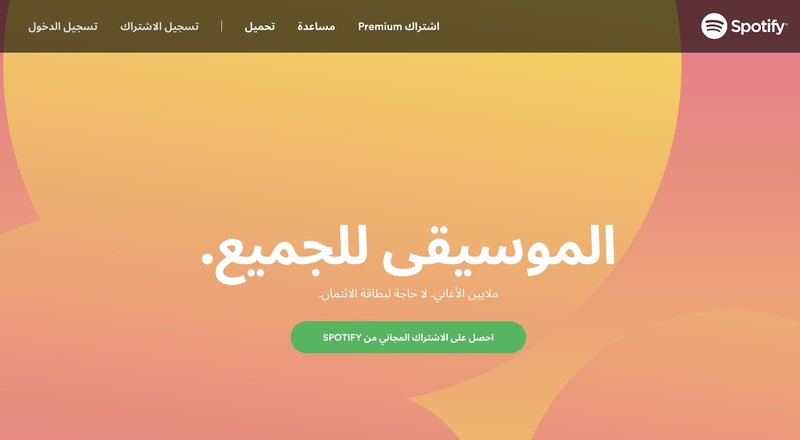 With more than 191 million active users worldwide (expect that to easily touch the 200 million mark soon with the MENA region) and 87 million subscription users (at their current rate, this will easily increase), users will definitely get access to Spotify’s vast library.